iEndorseU is social recruiting with a twist. Using our website and app, we aim to revolutionize how companies find the perfect candidates and how people find the perfect jobs to advance their careers. At iEndorseU our users share a common denominator, their industry savviness. So, users can leverage their industry knowledge to make intelligent matches between jobs and friends or colleagues in their network. Ready for the twist? We reward successful job matches with referral bonuses and we reward successful hires with a signing bonus. If you are an employer or job seeker, iEndorseU lets you socialize your job requirements or skills more efficiently than ever through referrers and endorsements. Our base of industry savvy users will simply pair job seekers to jobs. Our in house recruiters will validate each referral and ensure proper fit before submitting to a client. iEndorseU's social recruiting platform benefits all parties. With 25 plus years of experience in the staffing industry, and a staff of 100 recruiters, our Founder Andy Gaur saw a need to find avenues to source qualified candidates other than those already actively searching for jobs through job boards. Referrals have long been proven to be the best source for qualified candidates. However, internal Employee Referral Networks for many companies just don't yield that rich source of new employees as expected. Social Recruiting depends on a variety of algorithms to identify potential contacts of employees who might fit a job description, but they don't go far enough to identify who might be open to a change. Job boards yield no passive candidates and those already on job boards are bombarded with calls from recruiters, and frankly, most searches on job boards give you just too many matches that recruiters have to sift through. iEndorseU is the platform that provides qualified candidates, who are endorsed by a colleague for specific jobs that the candidate actually applies for. Employers cannot search our database of candidates and approach them. iEndorseU also necessitates proper (and frequent) communication and status updates between the recruiters and the candidates (as well as the person who referred the candidate). No more of "my resume has gone into a black box" or "what happened to the referral I made?". If you are an employer, job seeker or referrer, register to become an iEndorseU user today. We believe all new candidates deserve a signing bonus. We understand the complexities of offering a signing incentive, that why we have built it right into the platform. 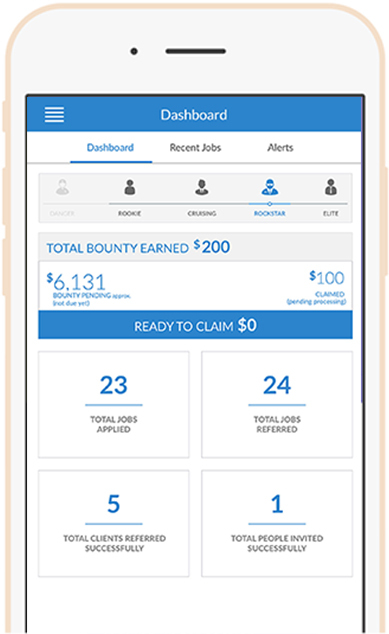 Hired applicants receive their bounty directly to their PayPal account from iEndorseU. Our platform will revolutionize how companies find candidates, essentially turning friends, colleagues and neighbors into active recruiters. In addition, all candidates will come with endorsements from collegues who have worked with them in the past. With increased costs of filling positions, recruiters are looking for effective tools to find the right candidate. Harness the power of ACTIVE social recruiting to fill positions at a fraction of the cost. Copyright © 2019 iEndorseU, Inc. All rights reserved.